It’s All Risky! – 1Beginner! Today, I want to discuss something that’s going to excite you. It’s about Risks. Why Risk is there? Why it’s important to take risks? Whether to take one or not? How to or Not? Yesterday night, I reached home late due to office work. I got stuck in traffic for about 3 hours before reaching home. I was so freaking tired that I didn’t have any interest to have dinner or energy left to do anything. Somehow I ate & did some night rituals & went to sleep. All of sudden my phone started ringing; I thought it’s my alarm but the clock was showing 3.15 am, I thought how it can wake me up an hour earlier. It was a call. I saw on the display it was a call for an emergency shift. I took it & I got to know that I got to go. I did necessary arrangement & I left home around 4.30 Am. Before leaving my mother was very worried about its High tension (11000 V) cable testing fault. She said it’s risky – Why don’t you make a reason & get away from this work. I said why should I? If someone else doing it, why shouldn’t I? By the way, it happens only once a month, that’s okay, I have to manage that. She said that okay but it’s Risky, that’s why! That conversation, happenings of day prior & a brief talk with my new friend put me into deep introspection. I started thinking yeah its Risky! Whether I should find a way to get away from the situation or to face it. To be very honest I am the guy of a different wavelength. I am a man of no excuses! So, running away from the situation got ruled out, still, I was thinking about The Risky psychology. I understood everything you need is always standing at a point beyond the Risk. The risk is always going to be there, standing right between you & what do you want. I have a big question for all of you? Show me something which is wonderful and not risky? Something better than what you have is always going to be a step beyond Risk! The risk is a gateway to your dreams. No matter how scary, challenging or difficult it seems to be, still, you got to take it! Too many people fear of Risk. But we have to understand what Risk is basically? The risk is nothing but the feeling. In my view, It can arise out of the possibility of losing something or while gaining something! The risk is nothing but the thrill & excitement of life. The Risk is mostly about losing the comfort of the existing before you gain something worthwhile in life. Let me share some scenarios of life, where we all have to risk somehow in order to live & grow in life. Travelling is risky – Don’t you see a lot of accidents happen on road? Talking to new people is risky – You don’t know whether people would accept you or not? Smiling with someone is risky – Maybe he/she would like or not? Quitting the existing job & finding a new one is risky. The Risk of losing the comfort of an existing job. The change is always risky. Pursuing a Passion is Risky – You don’t know what is going to happen. Talking to a Girl you like can be Risky – Whether she would respond or not. Initiating a heartfelt conversation with someone can be risky – You could be termed a fool out of yourself if that person doesn’t respond well. Talking on A stage is Risky- What If I Mistake? People would make fun of me. What If I forget my script! Writing a letter to someone is risky- What if He/She doesn’t like what you write? What if they misinterpret you? Admiring someone is Risky – You don’t know what they would think about you! It’s an appreciation or flattery? Living the life you want can be risky – You don’t know whether it would work or not? Expression your love to someone is Risky – You don’t know whether that person would accept you or your family would like it or not! Talking to New Person is risky – I don’t know whether He/She is the right person for Me. Falling in Love can be Risky – What if that person hurt Me? Or what would I do if He/she would leave Me in between? Trusting New People can be Risky- What If they are not genuine? What if they fool Me? Wearing a new fashion trend is Risky- What if people would make fun of Me, What if they would criticize me? Risk Is Going To Be There! Risk of losing your image, Risk of appearing as Fool, Risk of Rejection, Risk of No-response, Risk of getting exposed, Risk of Insult, Risk of failure, Risk of Embarrassment, Risk of losing your comfort, Risk of losing your composure, Risk of losing your old belief, Risk of Losing Money, Risk of Heart-break, Risk of Pain etc. is always going to be there. See, Risk is always standing right between you & your dreams. A risk is a pathway to success. If you try you might experience some of this. You might lose something. Still, you got to take it in order to gain something you desire. My Mentor Said perfectly – How it’s All Risky! The risk is a nothing but a stepping stone to success! If you take it you have to lose something but if you don’t you are going to lose everything then the only thing you going to retain is regret. The risk is something that completes the process towards your dream. Risk Is A Tool – Risk is not a scary thing, in fact, it’s a much-needed thing. It’s a tool only courageous people utilize. In order to live a great life, you have to take a calculated risk in all endeavours of your life. In order to gain something, you have to lose the old part of you. Your Dreams demands the risk in some sort or another. 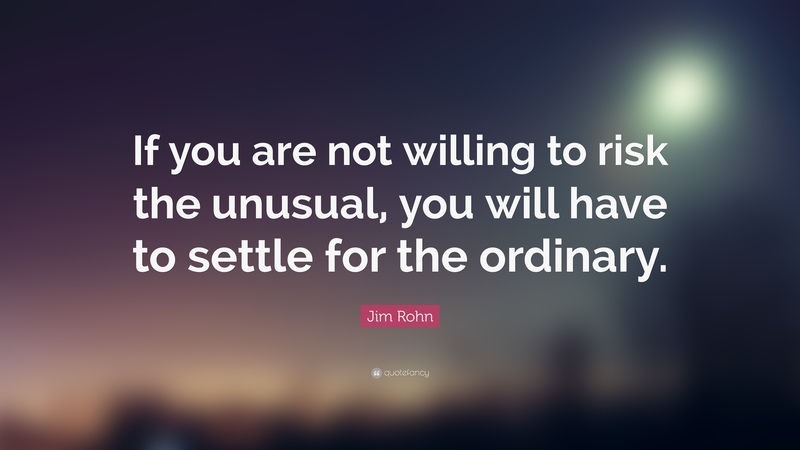 A risk is a tool you have to employ in order to be extraordinary. Ordinary people feel fear the fear & settle there unwilling to take a risk. Whereas some people feel the same fear, still take the risk in order to reach their dreams that’s what makes them extraordinary. Do they reach there directly? Nope, not at all. In the process they fall, they fail, they lose, they get embarrassed, they feel pain, they get frustrated, and that’s what makes them strong. That’s what makes them legendary. That’s what makes them stand apart. That’s what makes them unique. No battle is fought or won without risk. You got to take the risk in order to live the life of meaning the life of value, Life of Excellence! It’s All Risky! Still, You Got to Give it a Go! -Written by Mahendra Kapady@2019, All Rights Reserved.